I LOVE reusable decor! If I can reuse something even once, I will, and dual purpose items are used in nearly every party and event I do! 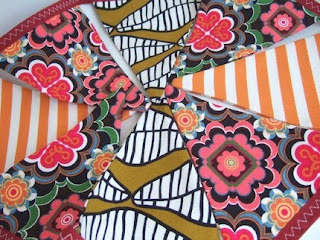 I trolled Etsy for some cute flags and bunting I was so excited to see these beautiful and whimsical pennants by PaperFish. This particular design, Frida/Carnival would be absolutely perfect for a mismatched, funky laid-back get-together such as a clothing swap or a little girl's pajama party. How adorable is the Bubblicious pattern!? This would be such a great addition to such festive events as an ice cream party, funky first birthday or garden tea party! The gorgeous Valentine Rose would be a sweet addition to a vintage valentine celebration, or a girly princess bash. 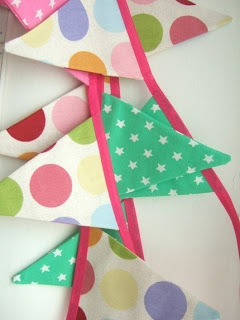 What do you think of PaperFish's reusable fabric flag bunting? 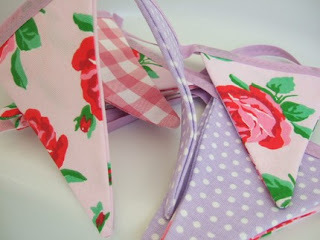 Do you use fabric flags/bunting and other reusable or dual purpose items in your event decor?